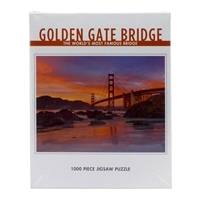 Let your imagination soar with our Golden Gate Bridge Mini Puzzle. Located at the mouth of San Francisco Bay, the Golden Gate Bridge is surrounded by a bustling maritime community. Featuring artwork by designer Charles House, this 100-piece puzzle beautifully evokes the atmosphere of the world-famous icon: boats and ships sliding across sunlit water; nearby hills dotted with wildflowers; birds, porpoises and whales gliding through the air and sea. A fun project for kids ages 12 and up, our Golden Gate Bridge Mosaic Kit is the perfect activity for a rainy day. Includes Ceramic tiles sorted by color, a backing board, glue, tweezers, and instructions with a layout grid. Dimensions: 5 7/8" x 7 7/8"
Relax and unwind with this 1,000 piece Golden Gate Bridge Puzzle. Located at the mouth of San Francisco Bay, the Golden Gate Bridge is one of the most beloved and photographed attractions in the world. In this remarkable image, San Francisco photographer Della Huff captures the drama and grace of the Golden Gate Bridge at sunset. Let peace and tranquility wash over you while you work on this beautiful piece, and fall in love with the Golden Gate Bridge all over again. Our new two sided puzzle features "It's a Golden Day on the Bridge Today", by San Francisco artist Camille Holvoet. Assemble the full color 20 piece puzzle, and color in the other side with wipe-off crayons again and again!